This again is an older article, but still very valid, something that I am learning every day in my breedings. One thing I would like to state here is: It is normal to fail breeding certain species. Some species have very specific requirements that we don’t know, for others we might not have the rights strategy. Normally every breeder is good with certain species and bad with others. Maybe that is the reason I am failing with Eudicella these days. Hence, I would suggest to always keep on trying to figure it out and share the experience. We are a rather small crowd, compared to other hobbies, and need to breed what we can get. 1.1.1 Different substrate height. Usually eight times the female’s length brings the best results according resulting egg numbers. 1.3 Different substrates. Some species like Glyciphana festiva will lay eggs only in or near pieces of rotten wood (structure still hard). Agestrata ssp. easily lay eggs, but larvae seem to develop in living roots (Pandanus ssp.). Dicranocephalus ssp. prefers fresh leaves that are pulled into the ground by the females and formed to packages, in each of which one egg is laid. Strategus anteus females are said to lay eggs only between layers of rotting grass mixed with sand. Thus we have to be creative and think of many factors when females deny egg laying. 1.4 Moisture level. Some species prefer drier conditions while others prefer more humidity. If drier species are kept too wet, eggs will easily mould and die. 1.5 Light. Unlike Dynastidae and Lucanidae, Cetonidae need at least 8 hours of light every day. 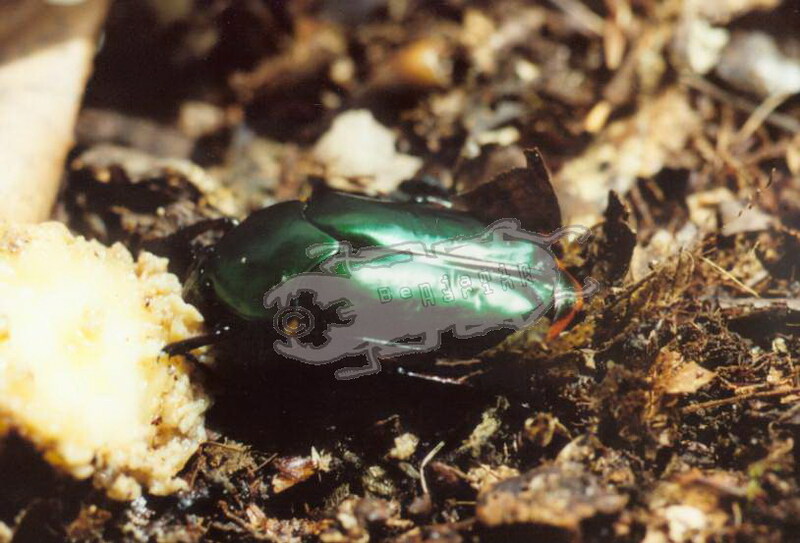 Some species prefer real bright one and longer than 8 hours (Mecynorrhina ssp. ), others do fine with a weaker light. Only then you will get eggs from them. 2.4 Changing the pH worth of the substrate with clay or peat, sometimes brings really astonishing results. 2.5 Remark July 2012: Temperature is a very important factor. This might have been overseen in earlier times. Especially for tropic species it is important to know the exact finding location. Species like Stephanocrates dohertyi, which were considered impossible to breed, became rather easy, when someone figured out to keep the larvae at below 20 degree Celsius. It seems that many Asian species (almost all bigger ones) in captivity have the main problem of pupating. On the one hand they die shortly before pupation, because they cannot find the right pupation place, on the other hand, they die during pupation. It is not normal that some species stay very long inside the cocoon (Jumnos ruckeri ruckeri in some cases over 7 months!). Maybe they are waiting for some signal to pupate, something like a temperature change, a change in moisture, etc. 3.3 There are a few species pupating in moss, or on the surface of the substrate between layers of dry leaves (Amaurodes passerini linnei). 3.4 Some species maybe need a change of temperature (Warm to cold) or moisture (Humid to dry) to initiate cocooning. 3.5 After the larvae pupated and they seem to stay longer than normal inside their cocoons, we have to stimulate them somehow to become active. Spraying the cocoons sometimes helps, same as changing temperatures (Cold to warm). 3.6 Sometimes it seems that the density of larvae has a positive effect on the growth of the larvae as well as pupation. Some species are better kept together, whereas others better are separated. I hope I was able to give you some thoughts on this topic. I know it is very theoretical and for some species maybe no help. I just wrote down everything I knew. Hints, Suggestions, etc., please send them to me.